First point of contact with the patient, and often also the last one, dental assistant is a vital worker in every single private dental office. What is more, a good assistant can turn an average medical practice to a great one, while a bad dental assistant can ruin the reputation of the doctor they work with. Bearing this in mind, hospitals, clinics, dental schools and dentists themselves choose their assistants carefully. They will use a combination of personal and behavioral questions in an interview with you, trying to understand who you are, how you would approach their clients, and how you would handle various situations that happen in a dental office on a daily basis. Let’s have a look at the questions, and how you can answer them. Why did you decide to pursue a career of a dental assistant? Tell me something about your education and training program. What you did like and what you didn’t like? Why do you want to work in our practice, and not somewhere else? Hand on heart, dental assistant does not belong to the best paying jobs in the world. What is more, you work in a close co-operation with another person–the dentist, which isn’t always easy, and can be tricky on a difficult day. But this job has also a lot of positives, and besides helping the others, you can also learn a lot as a dental assistant. And this is exactly what you should focus on in your answer: your desire to help the others, your desire to learn. You can also refer to a positive experience you have with other dental assistant (the one you visit as a patient), to your interest in dental care in general, or to anything else that motivated you to pursue this career (perhaps a childhood experience with a dental assistant). The most important thing, however, is to stay optimistic and enthusiastic in your answer. They should feel that you really want to do the job, and do not apply just becasue you have bills to pay or kids to feed (or both :)). Focus on the practical part of your training program. Talk about the subjects with enthusiasm. Show the interviewers that you enjoyed the program, and show a healthy level of self-confidence. Say them that after the program you feel ready to do the work. If you passed with A grades, mention it. If you passed with C grades, do not talk about your grades. Each of us doesn’t like a subject, or a part of any study program. But once you say that you didn’t like something, you should elaborate on it saying that you understand the importance of all subjects, and therefore you did your best in the lessons, even though you didn’t enjoy the subject. Most of us apply for a job in a hospital/clinic/health center that is located near to our house, so we do not spend half a day traveling to work and back home. Or we will apply for an offer that pays well, or basically for any offer, since these jobs are rare, and applications are plentiful. Nevertheless, you should focus on something else in your answer. You should find something good about the practice, and refer to it in your answer. Probably the best thing to refer to is a reputation of a dentist–a good one, of course. Or of the entire hospital/health center. You can also praise them for modern equipment, or for anything else, or you can say that your friends visit the particular dentist and praised their personal qualities. Needless to say, every dentist will love to hear that! 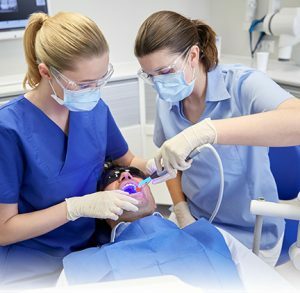 In reality, however, the job openings you will find will mostly be with dentists that have a mistake or two, or perhaps struggle in their relationship with the assistants, and that is exactly the reason why the job is available–the former dental assistant has left the job, or they have been dismissed. In this case you can be honest, and point out a good location of the place, or a good offer (salary plus benefits) that caught your eye on the job description. Tell me something about your previous working experience. 1. The quality of your answers to personal questions, and the impression you make on the interviewer. If they really like you, if they can imagine working with you after hearing your answers to personal questions, they may even skip the behavioral questions, and offer you the job straight away. Similarly, if they strongly dislike you, if they can’t imagine working with you after talking to you for first ten minutes, they won’t waste time with behavioral questions, and they will send you home. 2. The interviewing skills of the person who talks to you. 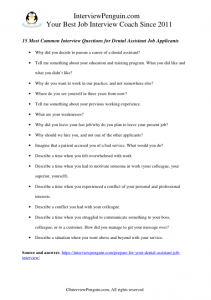 Dentists are not professional interviewers. If a dentist leads the interview with you, the chances are high that they know nothing about behavioral interviewing, and will skip these questions altogether. On the other hand, when you apply in a hospital or some private clinic, and an experienced medical recruiter leads the interview with you, they will almost certainly use behavioral questions. Though not common, these things do happen in every since dental office. In your answer you should emphasize that you understand the emotions and feelings people experience while sitting in a dental chair, the level of stress and anxiety. Say that you plan to take each patient’s feedback seriously, trying to become better in what you do, trying to serve them better. At the same time, however, you try to take each remark without emotions, and won’t start any arguments with the patients. Bad words you hear in work should not affect you emotionally, or at least not to a point that other patients will notice it. Special tip no.2: Learn more about body language in an interview, and say the right things without words. Each of us can have a bad day, each of us feels overwhelmed sometimes. There is nothing wrong with that. Show honesty in your answer, but ensure the interviewers that you know how to overcome a crisis (ideally on a practical example from the past, one when you managed to overcome the crisis). It can be taking a day off, it can be a good cup of coffee, or it can be some activity that helps you to gain new energy. Your attitude matters the most to the interviewers. Show them that you do your best to overcome any crisis of mental strength or motivation, so you can be back again soon, doing an amazing job as a dental assistant. Describe a time when you had to motivate someone in work (your colleague, your superior, yourself). Special tip no.3: If you struggle with the answers to behavioral questions, have a look at our Interview Success Package to see multiple great answers to all difficult behavioral questions. It is hard to estimate the difficulty of this interview, since it depends a lot on the person who leads the meeting with you, on their interviewing skills. What is more, if a dentist leads the interview, their personal preferences will play an important role. Only one thing is certain–there aren’t many job openings for dental assistants, and you will always compete with other people for the position. Practice with the questions from our article, and get ready for the big day. We wish you good luck! InterviewPenguin.com – Your best job interview coach since 2011. Healthcare Interview Questions – Interview questions for doctors, nurses, pharmacists and other positions in healthcare.